d Vym rivers, and it was then that he engaged in the conversion of the Zyriane (Komi peoples). Rather than imposing the Latin or Church Slavonic on the indigenous pagan populace, as all the contemporary missionaries did, Stephen learnt their language and traditions and worked out a distinct writing system for their use. 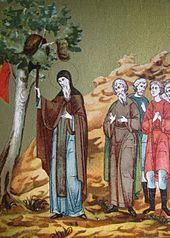 Although his destruction of pagan idols (e.g., holy birches) earned him the wrath of some Permians, Pimen, the Metropolitan of All Rus', created him as the first bishop of Perm'. Memorial table in Syktyvkar, capital of Komi republic The effect of the new bishopric and the conversion of the Vychegda Perm threatened the control that Novgorod had been enjoying over the region's tribute. In 1385, the Archbishop of Novgorod Aleksei (r. 1359-1388) sent a Novgorodian army to oust the new establishment, but the new bishopric, with the help of the city of Ustiug, was able to defeat it. In 1386, Stephan visited Novgorod the following year, and the city and its archbishop formally acknowledged the new situation. Subsequently, the region's tribute became the luxury of Moscow. These events had immense repercussions for the future of northern Russia, and formed but one part of a larger trend which saw more and more of the Finnic North and its precious pelts passing from the control of Novgorod to Moscow. The historian Serge Zenkovsky wrote that St. Stephen of Perm, along with Epiphanius the Wise, St. Sergius of Radonezh, and the great painter Andrei Rublev signified "the Russian spiritual and cultural revival of the late fourteenth and early fifteenth century." Indeed, Stephen's life encapsulates both the political and religious expansion of "Muscovite" Russia. Stephen's life was in fact commemorated in the writings of the aforementioned Epiphanius, who famously wrote the Panegyric to Saint Stephen of Perm, a text with praises Stephen for his evangelical activities, and styles him the "creator of Permian letters".